Serving Logan Brides since 1985. Bridal Faire is a great way to shop with many wedding vendors in one place. There will be Fashion Shows and ideas from the ring to the honeymoon. 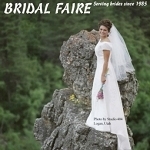 Bridal Faire is a great way to shop with many wedding vendors in one place. We will be giving away thousands of dollars in prizes. Please mention Salt Lake Bride when you call or register. The Bridal Faire in Logan was very well attended. There is a good mix of vendors and the venue is beautiful. It is great that there is no admission and parking is also free. Great fashion show.